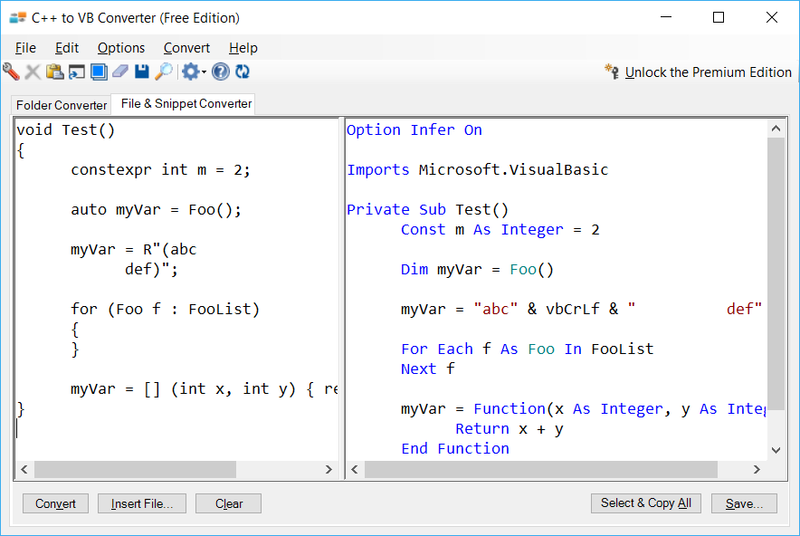 C++ to VB Converter produces great VB.NET code, saving you hours of painstaking work and valuable time. 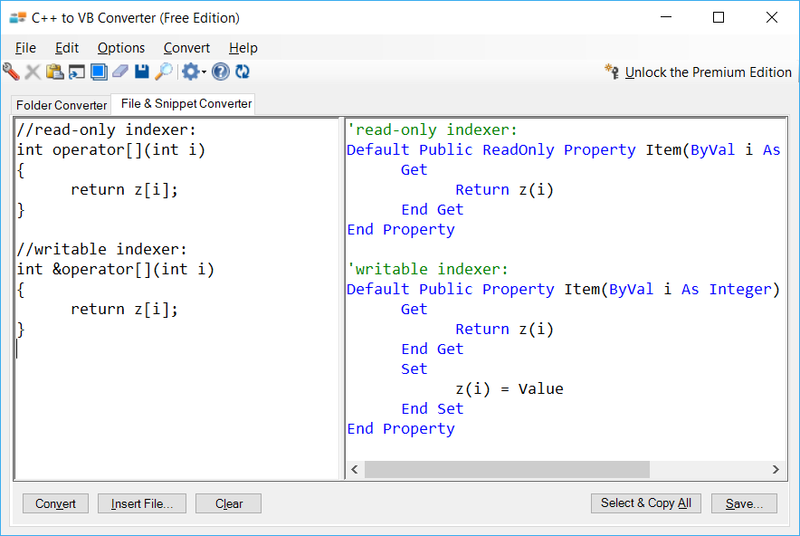 *Scroll right to see C++ to VB Converter in action! Our accuracy is the highest in the industry, but there will be significant adjustments required for all but the most trivial conversions. C++ code is much more complex than VB.NET code, so there are no direct equivalents for many aspects of C++. Read the rest of the FAQ to get an idea of a few things that are not converted. 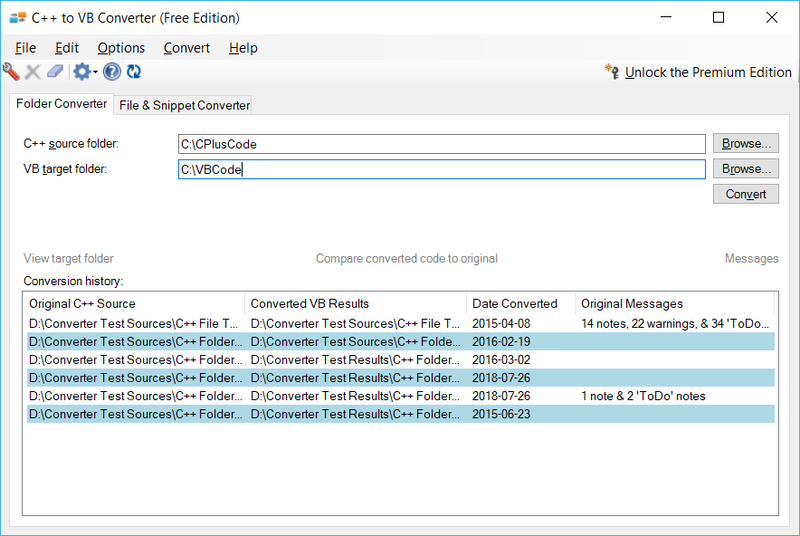 C++ to VB Converter is intended to reduce the amount of work you'll have to do to convert code to VB.NET, but it is just the first step. Code that is heavily dependent on pointer manipulation is better left in C++. 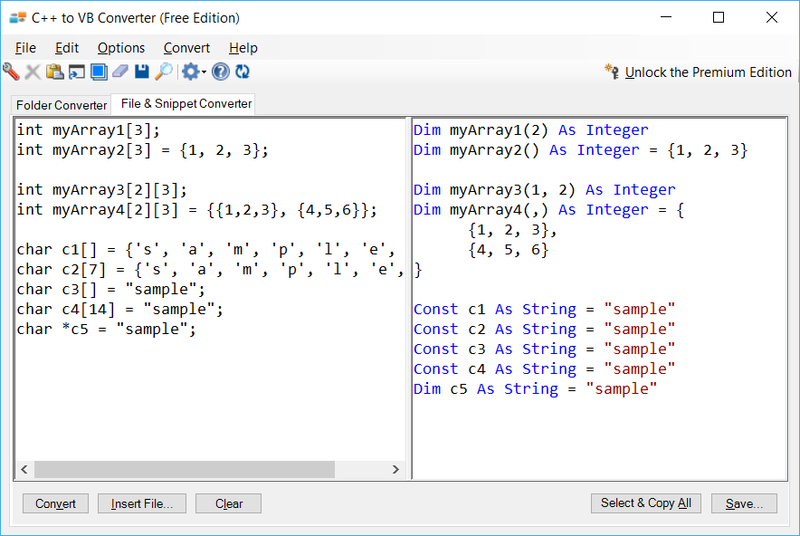 C++ to VB Converter converts function pointer typedefs to delegates. C++ to VB Converter does not convert MFC or ATL resources. C++ to VB Converter converts most references to std::vector, std::map, std::set, std::list, std::queue, and std::stack. A few methods of these containers that have no equivalent are not converted. Q: Is C++/CLI code converted? VB does not allow assignments within expressions, but C++ does (e.g., while ((x = y()) > 0) assigns a value to x as part of an expression). 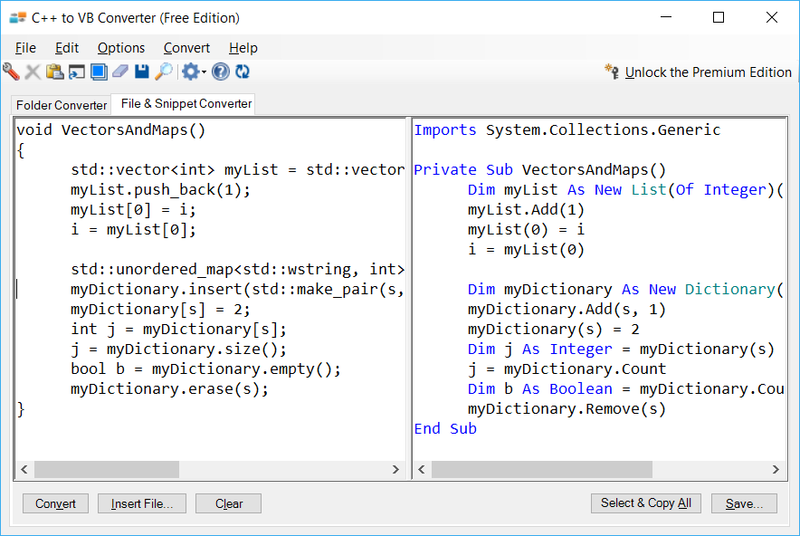 C++ to VB Converter will convert some cases, but will mark other more complex cases with a "ToDo" comment. You must manually adjust these. 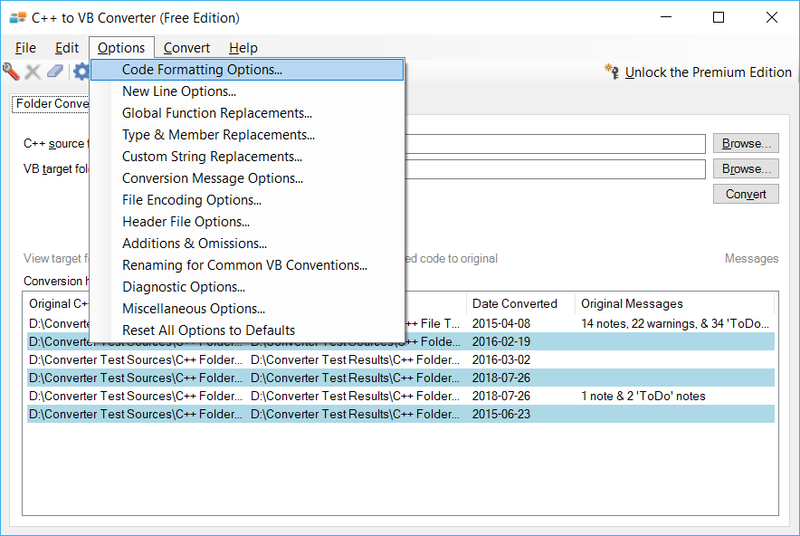 Multiple inheritance is not converted since it is not available in VB. C++ templates are converted to, but are only roughly equivalent to, VB generics. These may require further attention. Template metaprogramming has no good equivalent in VB. 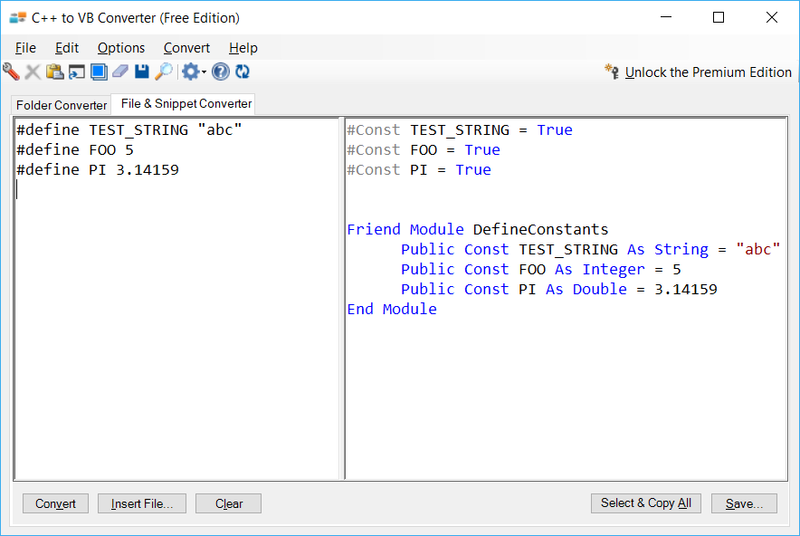 Bit-by-bit copying of objects via the assignment operator is not the default in VB. We attempt to detect these cases and convert the assignment to a call to either the copy constructor (if used in a variable initialization) or the converted assignment operator overload (which is converted to a 'CopyFrom' method) and also provide a 'Warning' comment. VB does not allow embedded assembly instructions. These are marked with a comment. There is no equivalent to friend functions or friend classes in VB. These are marked with a comment. Unions and bit fields have no elegant equivalent in VB. Unions are commented out with a 'todo' note. A few operators that can be overloaded in C++ cannot be overloaded in VB. These are marked with a comment.